The Packaging Aids Corp. Coffee PAC Vacuum/Gas Sealer provides roasters and packagers an efficient and economical method of preserving the freshness of their product. The Coffee Pac has four stainless steel nozzles for production efficiency. Four standard bags or two larger ones can be vacuumed during each cycle. The Coffee Pac packages approximately 4 cycles per minute or 16 bags can be produced depending upon operator efficiency. Additional nozzles can be added on request. The Coffee Pac vacuum system has a high-flow Venturi vacuum pump (dual venturi pumps is optional). Quiet and powerful, the Venturi allows the coffee particles to pass through without damaging the pump. The Coffee Pac comes standard with an air-flush system to clear the vacuum lines of any coffee debris after every vacuum cycle. The Coffee Pac can back flush the bag with any desired gas. The flushing sequence can easily be changed from vacuum then gas, to gas then vacuum, or gas only with no vacuum. All Packaging Aids machines for the coffee industry are supplied with biactive seal bars (top & bottom heat) to provide the utmost in security when sealing all types of plastic and foil bags. It can be ordered with either an impulse seal system or with a constant heat “barrier” bag seal system. The Coffee PAC has a built-in safety mechanism which automatically prevents seal jaws from coming together when an object is sensed between them. All electronic controls and pressure gauges are mounted in a control box above the seal head for easy viewing by the operator. 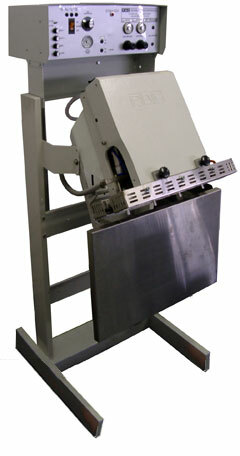 The Coffee Pac has a steel frame machine stand with rear wheels for easy station-to-station mobility. The sealing head is adjustable with three position height adjustment, as well as movement from a horizontal to a vertical position, for more convenient ergonomic operation.